Leading Manufacturer of florance georgette saree, georgette saree, saree, designer plain cotton silk saree, printed saree and sparkle-14 designer saree from Surat. 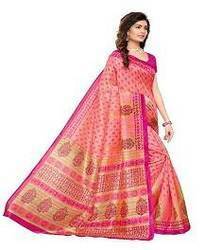 It is generally accepted that wrapped sari-like garments for lower body and sometimes shawls or scarf like garment called ''uttariya'' for upper body, have been worn by Indian women for a long time, and that they have been worn in their current form for hundreds of years. In ancient couture the lower garment was called ''nivi'' or ''nivi bandha'', while the upper body was mostly left bare. The works of Kalidasa mentions ''Kurpasika'' a form of tight fitting breast band that simply covered the breasts. It was also sometimes referred to as ''Uttarasanga'' or ''Stanapatta''. The tightly fitted, short blouse worn under a sari is a choli. the first cholis were only front covering; the back was always bare but covered with end of saris pallu. Bodices of this type are still common in the state of Rajasthan. In South India and especially in Kerala, women from most communities wore only the sari and exposed the upper part of the body till the middle of the 20th century.Poetic references from works like Silappadikaram indicate that during the Sangam period in ancient Tamil Nadu, a single piece of clothing served as both lower garment and head covering, leaving the midriff completely uncovered. Similar styles of the sari are recorded paintings by Raja Ravi Varma in Kerala. By the mid 19th century, though, bare breasted styles of the sari faced social revaluation and led to the Upper cloth controversy in the princely state of Travancore (now part of the state of Kerala) and the styles declined rapidly within the next half a century. In ancient India, although women wore saris that bared the midriff, the Dharmasastra writers stated that women should be dressed such that the navel would never become visible.By which for some time the navel exposure became a taboo and the navel was concealed.